pH indicators are supplied in plastic handy-pack that ensure long term stability and protection against many external influences. The indicator paper will always be ready-to-use when needed. 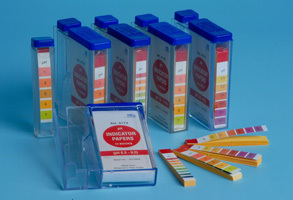 pH indicators are manufactured from high quality filter papers. Supplied with color scale- which makes the read –off of result easy and accurate.